The headquarters of the Institute are in Perugia. 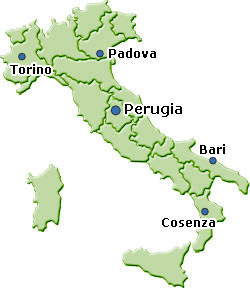 The Institute has four additional offices in Bari, Padova, Rende (CS), and Torino. The Institute is a network of laboratories and expertise, in Italy. The geographical distribution facilitates our R&D activities, and it allows our scientists to study natural phenomena where they occur, or where they are more frequent or abundant. Our network of laboratories facilitates the collaboration with local authorities interested in the activities and the products & services offered by the Institute. Hydrogeological study for the risk analysis of a landfill.